Here are five tips to help your c hild have a fun and sensory-friendly Halloween. 1. Halloween Preview – Talk to your child about what happens on Halloween. 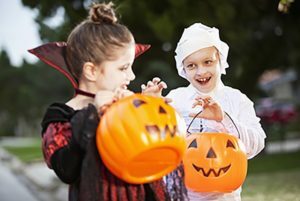 Explain the process of “trick or treating” including what your child will be doing, noises they might hear, and lights that might flash at them. Perhaps read a book where a character celebrates Halloween. If your child knows what to expect for the evening, they’ll be less likely to have a negative reaction. Find a video on Youtube or a movie of children trick or treating if possible, to show them what to expect. 2. Costume Practice Run – Costumes can be uncomfortable itchy and scratchy. For a child with sensory issues, these textures may be unbearable. Have your child try on all parts of a costume while you’re making it or before you buy it. 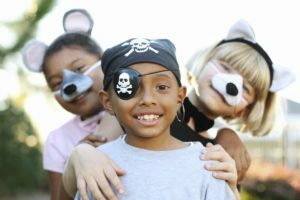 Let your child wear their costume around the house a couple of weeks before Halloween so they can get used to the new sensations and you can find fixes to any parts that may irritate them before the big night. You can also layer the costume over comfy well liked clothing. 4. 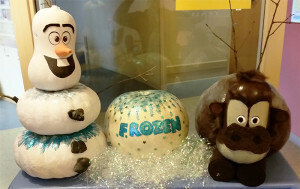 Pumpkin Play – The inside of a pumpkin, or “pumpkin guts”, can be a great sensory experience for your child. Help them cut open the top (if they’re old enough) and squish their hands around the inside of the pumpkin before carving it. For children resistant to submerging their hands in pumpkin innards, consider making a no-carve pumpkin by painting or decorating the pumpkin without cutting it open. 5. Know your child’s limits – For some children, “trick or treating” may simply be too overwhelming. If it is too much there are other ways to enjoy the festive holiday. Instead, host a Halloween party with one or two of your child’s friends, play fun sensory-friendly games, or invite friends and family over and have your child “trick or treat” from room to room in your house. 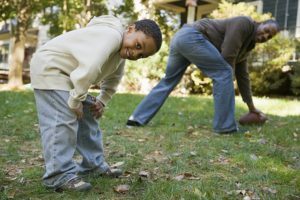 There are many Halloween activities your family can enjoy before & after trick or treating. Check out our list of corn mazes, lantern making, and more. Next Next post: Has There Been a Rise in Food Allergies?